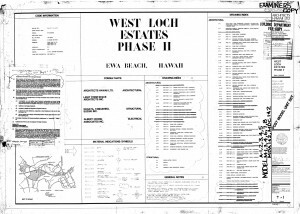 The West Loch Fairways Board of Directors has had the architectural and structural schematic drawings for all the different house models found in West Loch Fairways digitized and is making them available to all West Loch Fairways Association owners of record. 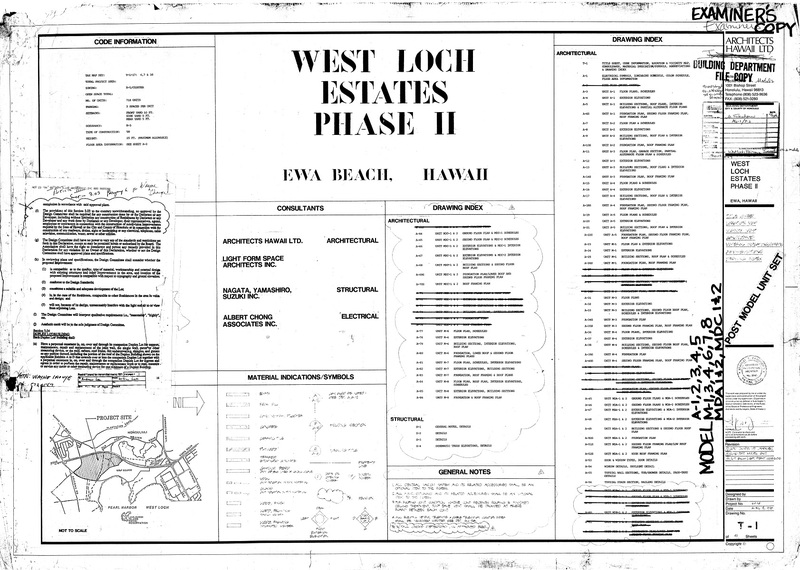 If you would like to obtain a copy of your house’s drawings please go to http://westlochfairways.org/contact/ and fill out the form include the file format that you would like PDF and / or TIF. Please be patient while I work through all the requests. In the future the drawings will be able to be downloaded from the website. As far as Aawa Drive, the Association was informed by the City’s contractor that the City was planning to remove the 36 monkey pod trees along the inbound lane of Aawa Drive (see tree post). The WLF Board is strongly opposed to this action and has made its opposition known to the Powers that be. As of this post the City and County of Honolulu has not contacted the Association regarding this matter. 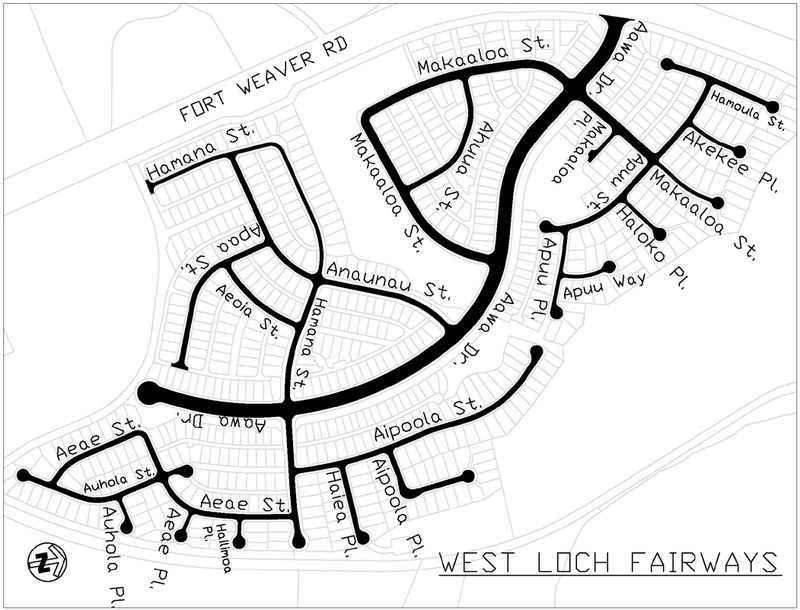 Please be advised there will be road work on the streets shown below. The work includes cold planing, resurfacing of asphalt concrete pavements and reconstruction of failed asphalt concrete pavement areas. Additional activities include tree pruning and/or removal of tree identified by the arborist; adjustment of utility manhole frames and covers; reconstruction of damaged concrete curbs and gutters; installation of pavement markers, striping and markings; and installation of vehicle detector loops. Speed bumps on private roads will be removed and will not be replaced. Work is tentatively scheduled to begin on Wednesday, April 27, 2016 for approximately 90 days. The allowable work hours will be from 8:30 a.m. to 3:30 p.m., Monday through Friday, and possible weekends except holidays. Road users are reminded to observe and obey all traffic controls, posted signs and Special Duty Officers. On-street parking will be prohibited during working hours, PLEASE OBSERVE THE DATES AND TIMES ON THE POSTED ROADWAY SIGNS; illegally parked vehicles will be towed, if necessary, at the owner’s expense. Motorists are advised to proceed with caution through the construction area. Construction Manager: AECOM Technical Services, Inc.